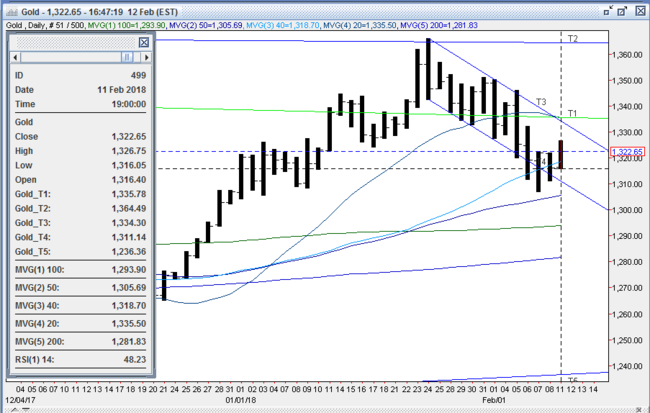 Gold remained nervous and choppy overnight along with other markets in a range of $1316.05 - $1326.75. The yellow metal shot to its high early during Asian hours, taking out the double top at $1322-23 while fading a drop in the dollar from 90.35 – 90.07. Weak openings to the NIKKEI (-3.5%) and the SCI (-0.3%) aided the move. However, global equity markets subsequently rallied (NIKKEI bounced to finish -2.3%, the SCI rebounded to end +0.78%, Eurozone shares jumped 1.1% - 1.5%, and S&P futures were +1.2%), aided by stronger reports on Chinese New Yuan Loans and Money Supply and a rebound in oil (WTI from $59.10 - $60.83, OPEC raises demand forecast). This, along with a spike in the US 10-year yield to a fresh 4-year high at 2.902% (Trump announcing new infrastructure spending plan) lifted the dollar back to 90.33 - and pressed gold down to $1317.50 ahead of the NY open. US stocks opened firmer, and strengthened into the afternoon (S&P +50 to 2671), with energy and financials leading gainers. The 10-year yield was a little choppy, dipping to 2.83% before climbing back to 2.865%. The dollar declined along with the dip in yields (DX to 90.16), but was also pressured by some euro strength ($1.2234 - $1.2290). Gold advanced to $1326 in response, but was capped at its overnight high. Later in the afternoon, equities came off their highs, but still finished fairly firm (S&P +36 to 2655), with a pullback in oil weighing (WTI to $59.10). The 10-year yield was steady between 2.855% - 2.865%, but the DX ticked lower (DX to 90.12), still pressured by the stronger euro (euro to $1.2297). 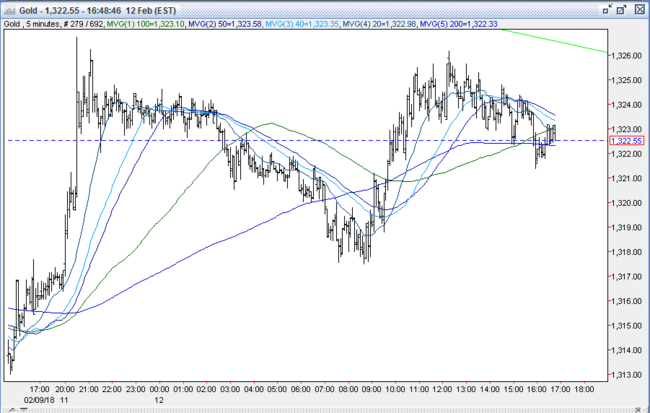 Gold couldn’t capitalize on the weaker dollar, however, and drifted back to $1321.20. The yellow metal was $1321.50 bid at 4PM with a gain of $6. Open interest was off 7.0k contracts, showing more long liquidation from Friday’s decline. In the past 5 sessions, open interest has declined over 36k as gold has fallen from the mid-$1340’s to the $1307 low last Thursday – much of it caused by liquidating longs. Volume was lower with 334k contracts trading. Bulls were encouraged that gold posted a solid gain today, given the strong continued recovery in equities, and the US 10-year yield making fresh 4-year highs. They expect the DX to once again probe below 90 which should give gold a push through resistance at the old support area between $1326-29. Beyond next resistance at last Wednesday’s $1332 high, bulls point to a lack of significant resistance and see open field running until the $1346 high from 2/6. Bears are expecting further gains in equities and the US 10-year bond yield to take the DX past its triple top at 90.57-60 to pressure gold lower. They’ll be gunning for more long liquidating sell stops under the triple bottom at $1306-7, $1300-01 (50% retracement of up move from 12/12/17 $1236 low to 1/25/18 $1366 high), and then the 100-day moving average at $1293. All markets will continue to focus on the volatility in the equity and bond markets, geopolitical events, developments with the Trump Administration, corporate earnings, oil prices, and will turn to reports tomorrow on Japanese Machine Tool Orders, UK CPI and PPI, US NFIB Small Business Optimism, and comments from the Fed’s Mester for near-term direction.